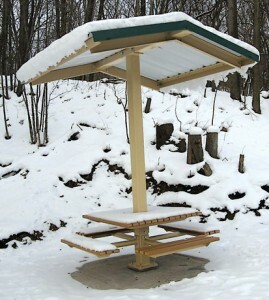 At the halfway point of the 2010 Friends of the White Pine Trail Resolution Walk is this permanently installed, metal-covered picnic table that was generously funded by the Wolverine World Wide Foundation. The Friends of the White Pine Trail are hosting the ninth annual New Year’s Resolution Walk at 10:00 a.m. on New Year’s Day, Friday, Jan. 1. Over the years, the annual New Year’s Day morning event has quietly built an ever-increasing number of participants who couldn’t think of a more fitting way to kick off a new year. The event is not just for members of the Friends; everyone is invited. The walk is totally free and noncompetitive. Young and old alike, many with dogs on leash, step off on a positive note into the New Year. “This year’s walk is special, because we are entering a new decade, a decade where the Friends anticipate achieving their mission of seeing the Fred Meijer White Pine Trail [FMWPT] paved in its entirety all the way to Cadillac,” said Dave Heyboer, chairman of the Friends. 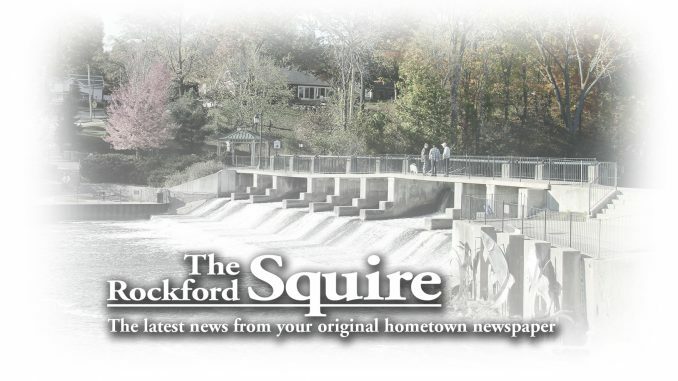 After posing for an annual group picture in front of Rockford’s downtown Rotary Pavilion, the walkers will stride off into the winter wonderland of the trail route, the FMWPT. “The walk will take about an hour and is a great opportunity to catch up with friends, appreciate the beautiful view along the trail, or just enjoy a time of quiet contemplation,” Heyboer said. Instead of heading north to 12 Mile Road, this year for the very first time the trekkers will head south. Yes south, so all can enjoy a different venue and see one of two new covered picnic tables that were generously funded by the Wolverine World Wide Foundation. The total walk will cover approximately four miles with the halfway turn-around point being at the recently installed trailside picnic table just south of House Street. Upon completing the walk, participants are invited to enjoy fellowship with one another in the warmth of the Rotary Pavilion, heated for the occasion. Refreshments, as always, will be cheerfully provided by the Friends. So, dress accordingly and don’t be deterred by another “sky is falling” weather forecast by area meteorologists that might not be accurate. After all, this is West Michigan and it is winter!